One of 499 came to P1 Motorcars for some “Paul Dalton” Modesta coating and future upgrades. 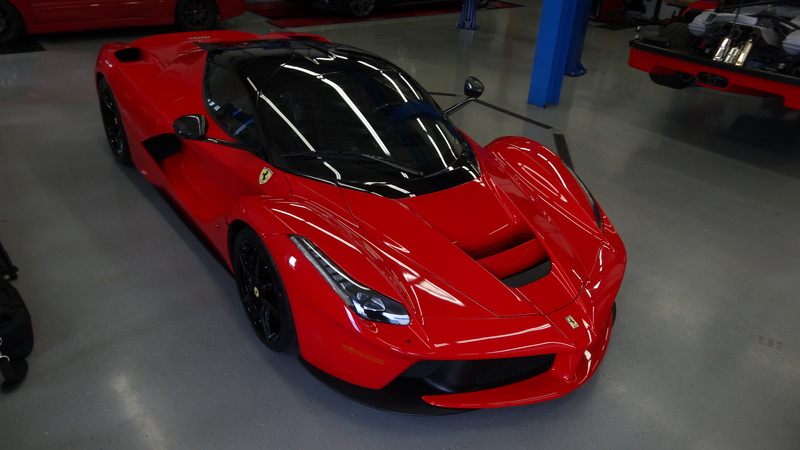 The performance figures of the Ferrari LaFerrari set a new standard. Ferrari has only revealed that the LaFerrari’s top speed is in excess of 217mph (350 km/h) but car is said to be capable of considerably more. Power for the LaFerrari comes from a 789bhp version of the F12’s 6.3-litre V12, working in tandem with a 161bhp electric motor to drive the rear axle. Ferrari claims the motor’s high torque output at low revs allowed it to tune the V12 to produce its best at high revs. The result is huge power on tap, at any speed, in any gear. Peak power arrives at a heady 9,000rpm and maximum torque of more than 900Nm is delivered at 6,750rpm. The tricky job of marshalling all that thrush is handed to Ferrari’s seven-speed dual-clutch F1 gearbox. A 60kg lithium-ion battery pack attached under the floorpan helps give the car a 35mm lower centre of gravity than the Enzo. It’s charged under braking and whenever the V12 produces more torque than required. The batteries supply power to the electric motor, which is hooked up to a seven-speed dual-clutch gearbox. This hybrid system means that the LaFerrari emits just 330g/km of CO2 – an impressively low figure given the level of performance on offer.